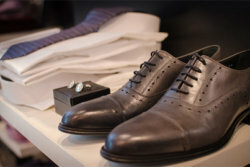 We Can Get Your Shoes Looking Their Best! Over time and with multiple wears, our shoes can start to look a bit ragged. When you are really attached to a pair of shoes that is looking worn throwing them out or donating them can be rather difficult. After all, they’ve been with you through so much, do you want to just get rid of them? If you’ve got some shoes that have seen better days our expert team offers shoe repair services that can revitalize them so they look their absolute best. We treat all clothes at our Hollywood dry cleaners like the stars they are and can treat all kinds of issues contributing to that worn look. If your shoes are in need of a caring touch, call Bubbles Dry Cleaners at 323-461-6050 or 323-382-5541 and find out how we can help you!